Happy Wednesday babes! Despite a little Five Guys and hoagie fest this past weekend, I am making an effort to eat as healthy as possible and feed my fam bam the same (my kids loathe it.) I am always trying to find as many new, fresh recipes as possible, and sometimes the best ones come out of what you're forced to making when staring into an almost empty fridge full of veggies that need to be finished. I have tried just about every diet on the face of the planet at this point, and I come back to the same principles time and time again: eat fresh, pure, wholesome foods. This is the mindset I try to stick with, along with the 80/20 rule: eat really damn healthy 80 percent of the time and live a little the other 20 percent. For me, keeping this balance is the biggest struggle for me and the scale. I personally love eating vegetables, but struggle to get out of diet mentalities and then go a little too wild in the pantry on the weekend. We all have our things amIrightoramIright. I made this recipe while we were at my parents' house and I was trying to clean out their fridge one night, and cannot stop making it. 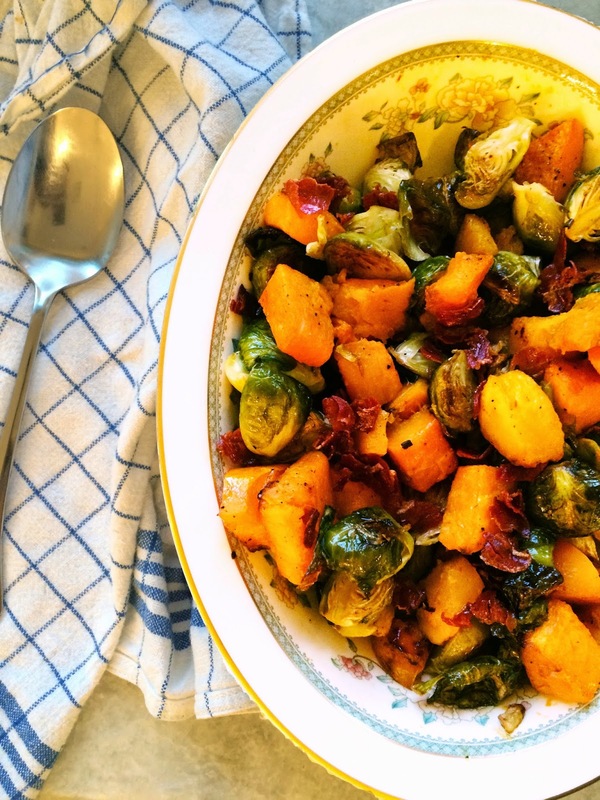 Unfortunately my husband and children aren't fans of butternut squash OR brussels sprouts, but I promise you, this is so tasty. It's a mix of Pinterest browsing and Ina reading with a dash of what I had on hand that came together just right. 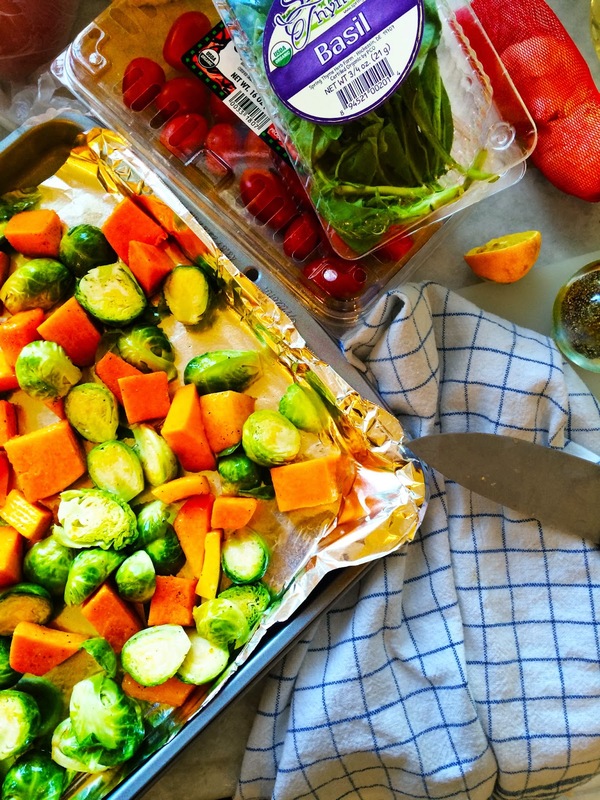 - Cover a baking sheet with tin foil and coat with olive oil spray. - In a large bowl, add butternut squash, brussels sprouts, garlic, salt and pepper. Spray olive oil spray and toss evenly to coat. Arrange in a single layer on baking sheet and bake for 45 minutes, or until tender. - In a skillet on medium heat, spray a tiny bit of cooking spray then add prosciutto and cook until crispy, stirring. This takes about 10 minutes. Make sure you watch it! - When everything is done, combine squash, brussels sprouts, garlic, and prosciutto in a large bowl. Toss with olive oil and a dashes of white balsamic glaze to taste and serve. *regular balsamic glaze would also work. We served this with salmon, but I think it's best with a red meat or poultry. I always eat the leftovers, and sometimes mix with quinoa or brown rice to make it more filling and meal-like. Ummm YUM. I will definitely be making this - love that you added prosciutto, that just really tops it off!! I was never a fan of brussel sprouts until my sister in law made them for Christmas this year in some delicious balsamic sauce and they were SO GOOD. Ever since then I've been interested in trying them again and this recipe looks delicious!! This sounds SO good!! I can't believe your family doesn't like it, especially with the sweetness of the balsamic. Going to try this soon! Dang girl! Look at you being all healthy! I love the addition of prosciutto... easily one of my favorites!! I've never tried white basalmic glaze but it sounds amazing! I try to live like you with the 80/20 mentality, as I mostly eat clean during the week and then "live a little" on the weekends. We're supposed to give in to our cravings here and there, but right now I'm totally ignoring the email blast that just went out in the office about donuts in the kitchen. Kate Spade Friends and Family Sale!